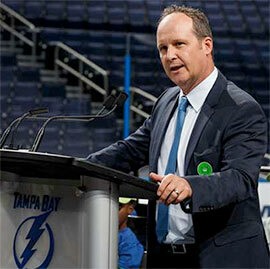 Steve Griggs, a Laurier alumnus and former member of the Golden Hawks men's hockey team, has been named chief executive officer of the NHL's Tampa Bay Lightning. Griggs (BA '92) joined the Lightning in 2010 as the organization’s chief operating officer and was promoted to president in 2014. Prior to his career as a sports executive — which has spanned 22 years to date and includes leadership roles with Maple Leaf Sports and Entertainment, the NHL’s Minnesota Wild and the NBA’s Orlando Magic — Griggs was a forward on some very successful Laurier hockey teams. Starting with the Golden Hawks in 1988, Griggs was part of back-to-back Ontario University Athletics (OUA) championship seasons in 1988-89 and 1989-90. He scored 18 goals in his OUA career. Among his teammates at Laurier was current men’s hockey head coach Greg Puhalski, the team’s all-time leading scorer, who returned to the Golden Hawks as a coach in 2010. This past season, the Lightning made an impressive playoff run all the way to the Stanley Cup final where the team lost a hard-fought battle to the Chicago Blackhawks in six games. Despite the outcome, it was the team’s second deep playoff run during Griggs’ time with the organization. The Lightning organization is well regarded around the NHL for its future potential on the ice, as well as its sound financial state and devoted fan base, which Griggs played a key role in developing. Since starting with the Lightning in 2010, Griggs has overseen a substantial rebranding of the team, significant improvements in fan experience, including a full renovation of the team’s arena (now called Amalie Arena), and a large increase in season-ticket sales. The full release announcing Griggs’ promotion to CEO is available on the Tampa Bay Lightning website.